Chinese Zen monk who had given strongly influence to Japanese Zen. Ingen (1592-1673) is Chinese Zen monk in the latter of Ming Dynasty. He’d come to Japan to take up top monk’s post at the Buddhist temple of Chinese town at Nagasaki, Japan. His Zen was Chinese Rinzai Zen mixed Zen and Nenbutsu. His Zen used to have been very influential, so he has been given permission to establish his temple by 4th Shogun, Tokugawa Ietsuna. His influence had strongly given to the restoration movement of Japanese Rinzai & Soto Zen. Oubaku Zen head temple is Manpuku-ji at Kyoto, Japan. 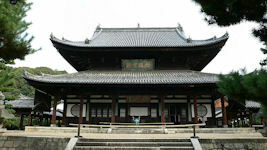 Oubaku Zen is comparatively new Buddhism branch among any other traditional Japanese Buddhism (brought in Edo era), so temple’s atmosphere is Chinese-like. 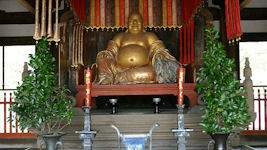 Oubaku Zen’s principal image is Miroku Bosatsu (Maitreya). But Oubaku Zen’s Miroku Bosatsu is looks like Hotei (Hotei is incarnation of Miroku). Hotei is legendary Chinese Buddhism monk who lived in Tang Dynasty.